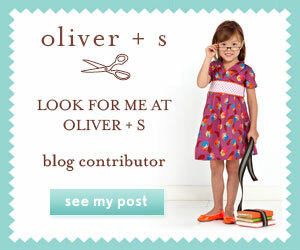 This is the second time I have used this pattern the Oliver + S Ice Cream Dress/Top. My first go at it was the dress version. It fast becoming one of the favourite go to items in her wardrobe so I wanted to make the top as well. The fabric I have used is Alexander Henry: Haru Garden Natural Pink. I love the details of the print. It is fun to look at. I made sure the front and back panels were identical, I wanted it to look the same both ways. This involved some pattern matching which was actually quite fun to do. The yoke is lined in a solid pink cotton to give a flash of colour through the sleeves. I chose to edgestitch the neckline simply because I didn't want the pink to poke out too much from the edge. I used a red button to lift some of the colour out of the fabric. When I look at it, the little figure in red pops out at me. Unfortunately there is no escaping the fact that when using a large pattern on the yoke, the picture will end up upside down on the back. I studied it for ages before managing to get as much foliage on the back section as I could to limit the wrong-way-up dilemma. I have two figures on the left side that are on their heads but hopefully it won't bug me too much. It is a size 7T so it will fit her over the cooler seasons. The arms seem quite long at the moment. She would fit into a 6T now, I liked the pattern so I may make another one in a smaller size if I have time.